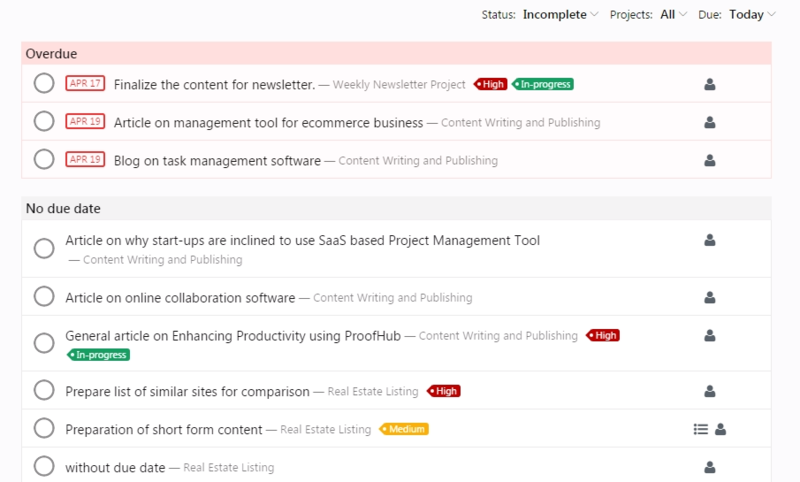 Me section of ProofHub displays all your overdue tasks, tasks that you need to work on today, tomorrow, this week etc. 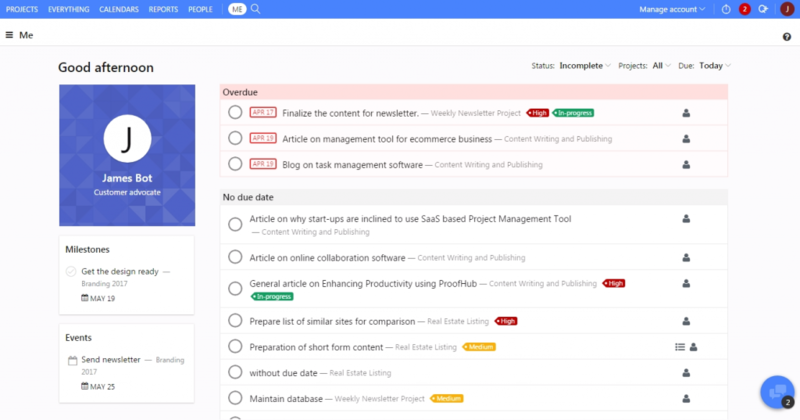 By default, it displays the tasks that are assigned to you across all projects. At the left of screen, below your profile there will be list of all overdue and recent upcoming events/milestones assigned to you. At the right of screen, it will display all your overdue tasks at first place and then, due tasks for today, tomorrow, this week, next week etc. To view the task details, click on any task and its detailed panel would open from where you can edit the start and end date of your task, track time, edit label, attach files, set percentage progress and manage people on task by clicking their respective icons. 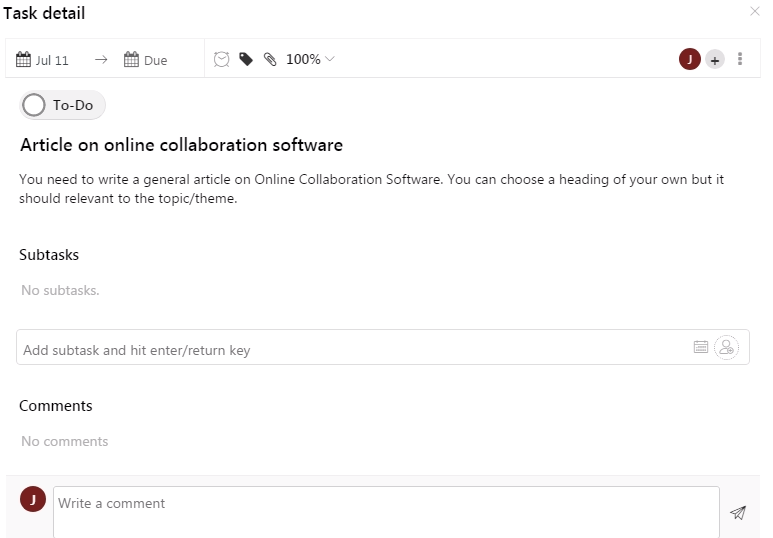 You can also edit/delete task or manage people by clicking the menu icon from the right. And, If you want to go to the task inside the project, then choose Go to Task option from menu icon. You will be redirected to that task in project. To complete any task, just click the checkbox beside task. It will be marked as completed and disappear from Task by default as Me view displays only incomplete tasks that are assigned to you across all projects. Click the dropdown menu besides Status and choose Complete option to see all completed tasks. By default, Status filter is set on incomplete option and displays all incomplete tasks assigned to you. 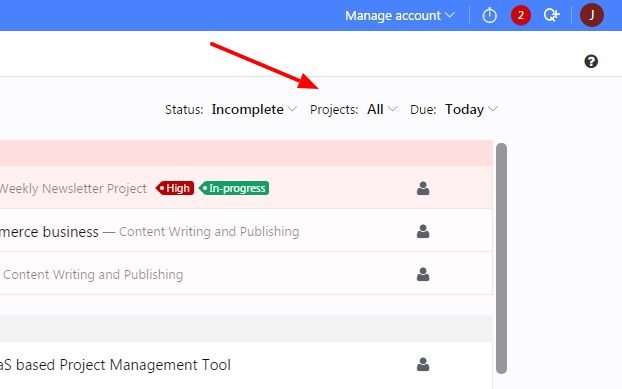 Click the dropdown menu besides Projects and select any project or projects then it will be displaying tasks of selected projects only. Click the dropdown menu besides Due. You will get options such as today, tomorrow, etc. Select any of the options to view tasks for that particular day. For e.g. 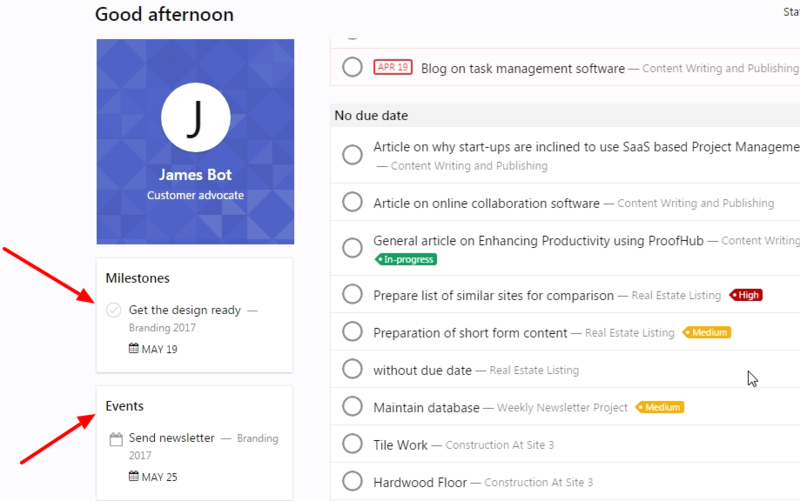 if you want to view tasks for today, then select today from the dropdown menu. At the left of your screen, you will be able to see the list of overdue and upcoming milestones along with the list of events that are scheduled for today. If you click on any milestone/event, you will be redirected to that milestone or event in Calendars section. And, if you mark any milestone or event as complete then it will be disappeared from the list.